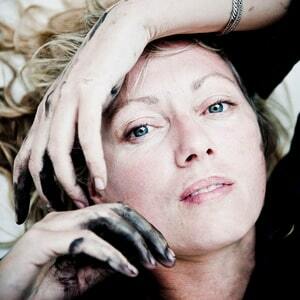 British born Pauline Amos is a creative performance and painting artist with a unique style of work combining performance, painting and music. Amos has a PhD from Dartington College of Arts, and has drawn international acclaim for her provocative, powerful and bold works. Amos experimented in Liverpool’s music and acting scene in the 90s before incorporating her experience into painting and performance art. In the early 2000’s, Amos held a series of in-gallery performances entitled ‘My Flesh My Canvas’, which led to exhibitions and performances throughout Europe and Asia. Evolving the work of Kandinsky and Schoenberg, who extolled the harmony between art and music in the last century. Amos uses the body as a blank canvas to explore the interaction between performance, art and music. In 2009 she held an exhibition and performance in London titled ‘Atomic Forms and Their Corruptions’, using her naked body as a canvas, working in the moment and placing herself within the painting, to become part of it. Stating, ‘the art is the person – the life that is making the work. The paintings are documents and a recording of an event, an action that happened – they are not the work; the action, the performance the improvised and impulsive moment is the work’. Other major works include a 24 hour performances in The Opera Paese Gallery, Rome, which resulted in Amos launching her first London exhibition in 2005 showing the Opera Paese Gallery performance painting with a price tag of £1.3m. A work that later became known as ‘the £1.3m’. When asked how long the painting had taken to complete, Amos replied, ‘all my life and the value of life is priceless’. The price was purposefully provocative, creating significant media comment and opinion. In Amos’ latest body of works ‘Pity the Meat’ she pays homage to the writing of Deleuze and Francis Bacon. Also referencing the ‘body without organs’ by Antonin Artaud, a rejection of pre-determined organisation imposed on the body. Amos’ improvisational approach to her work is as a ‘Demonstration of Liberation’ from societal codes, political inscription, dogma and doctrine. Amos’ dramatic work is her understanding of the human condition, a response to the world around her and with an underlying narrative of her life and experiences. A full biography of Amos’ work can be found below. 2016: Paintings – exhibition @ Hodsoll Gallery London. 2009: ‘Corridor’, short film, directed, edited; Dingle Film Festival 2009: ‘Bad Habits’, short film, Cannes film festival. 2003: “24 Hours.” Opera Paese Gallery, Rome. (I) 24 Hour durational Painting Performance & Installation.